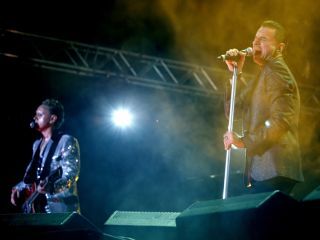 Martin Gore (left) and Dave Gahan on stage in 2009. On 16 and 17 December, everyone's favourite electronic pop pioneers, Depeche Mode, checked into the enormous O2 Arena for the British stint of their massive Tour Of the Universe. 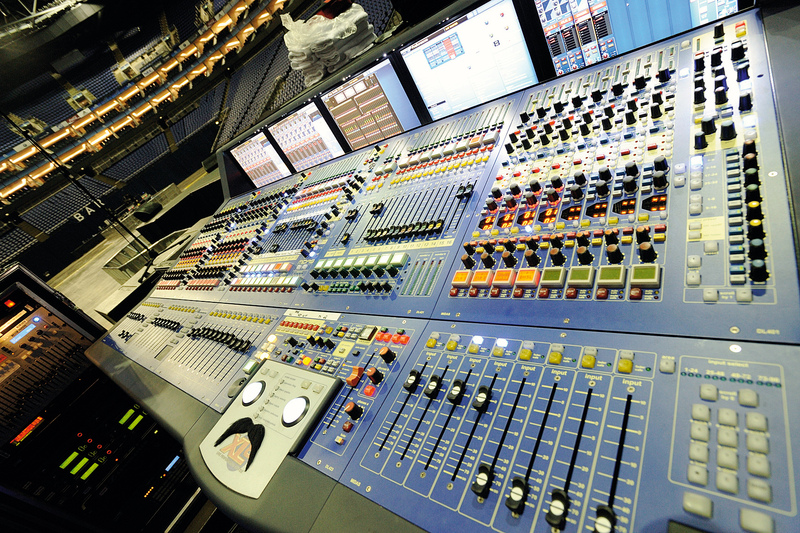 Taken with them were eight mega trucks, packed with gear selectively honed from over 20 years of touring experience and a 20-strong support team that's armed and ready to deal with anything the clash of live tour and hi-tech can inevitably throw up. 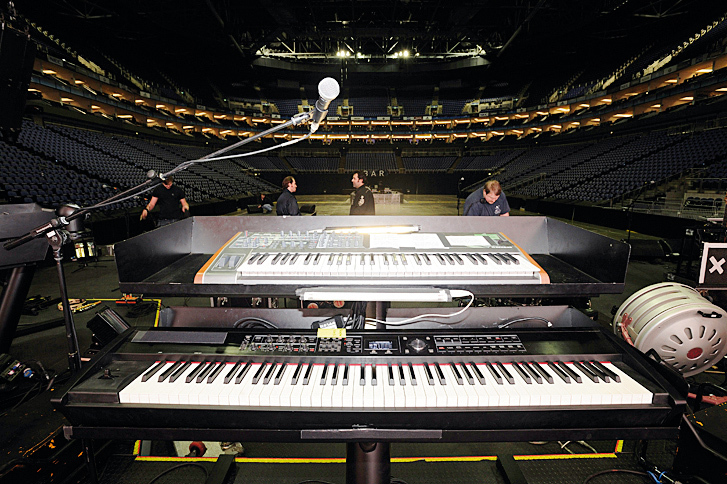 Put in charge of the hi-tech team is Paul Eastman, the keyboard technician and programmer for the tour and the man DM trust to make their sound happen on stage. Things seem to have changed since Depeche Mode were a bunch of Emulators and that famous pair of Revox reel-to-reels running the show. Paul Eastman: "Ah yes, there used to be two in case one went down. These days we're using the Radar system for the same job and have been for quite a few years too. Mainly because it's so solid. But the chap who used to press play on the tape machines for them back in the '80s ,JD, is still with them. He was around last night, in fact." Paul Eastman at the helm of The Mode's Radar setup. This looks like a monster rig. How long did you spend trying different options, trying to come up with the final set up? "In the past that meant they relied a lot on samplers: Emulators and the old Emax sampler, but all the samples were too grainy to use again and needed updating. So Kerry [Hopwood, Live Programmer/Musical Director] went back to the original two-inch tapes again and redid all the samples for this tour. So, we're using those new samples and some plug-ins for our sounds too. 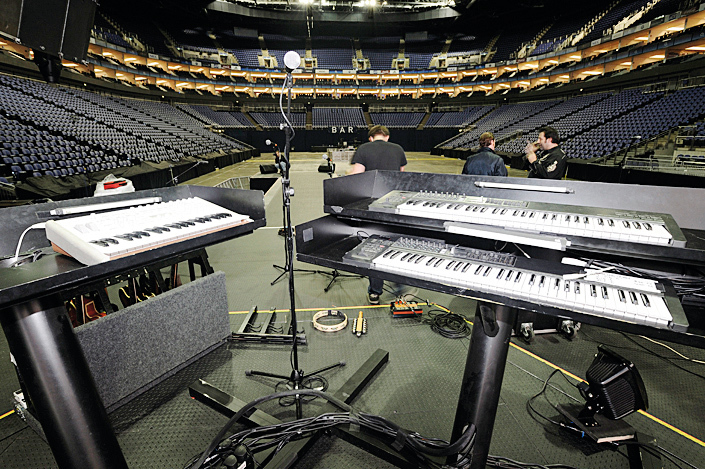 "After we managed to convince the guys not to take all the old keyboards out we spoke to a few people about Muse Receptors and they told us that they were rock solid. So that seemed the best way to go. The last time they toured they were using Logic and the EXS sampler but they had a few glitches with it. I've used sequencers for playback for Snow Patrol and the Verve - we were using Logic - and they ran fine. But Kerry trusts the Radars. We used Pro Tools for the playback, during rehearsals but just before the tour started we printed the tracks to our pair of machines. "Sample wise we're using Native Instruments Kontakt and Massive a lot too. We're also using a lot of GMedia ImpOSCar and Synthogy Ivory for pianos too. There are some sounds you can't get with the synths, so we use the samples for those, but there's a lot we can do and we try to use the synths as much as possible. Stripped is a good example of that. The big lead sound is Massive and ImpOSCar all layered up to create that main riff sound." And the plug-ins are all hosted in Muse Receptors? PE: "Yes, we've got six of them: two per keyboard player. Each pair is a main A and a backup B doing the same thing. 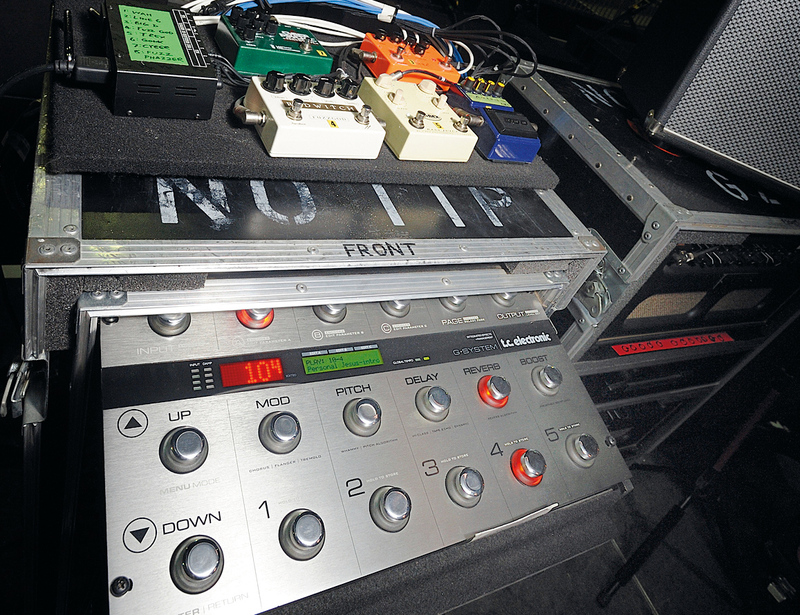 Then we've got a custom-built switch box at the side of the stage so we can switch between each keyboard player's Receptor if something goes wrong." Each keyboard player has a backup Muse Receptor should the worst happen. Is there any live sequencing going on? PE: "The Receptor stuff is completely separate from the playback side. I'm doing all the program changes on the Receptors here, off stage, but we are using both Ableton Live and Pro Tools alongside the Radars. Each is on a separate MacBook Pro. Ableton Live is being used just for live drum processing while Pro Tools is there for the program changes that are flying about on stage, changing the keyboards and stuff like that. Paul controls the Receptors from his laptop. "It works like this: The Radars are kicking out time-code which is going into Kerry's laptop running Pro Tools. So Pro Tools runs in time with the Radars. Program changes are fired out of Pro Tools for the guitar rig and the keyboards on stage, and into a bit of software that I wrote that controls Ableton Live in the second computer. You load all your projects into it and when it gets the change it closes songs in Ableton Live and loads the next one up. 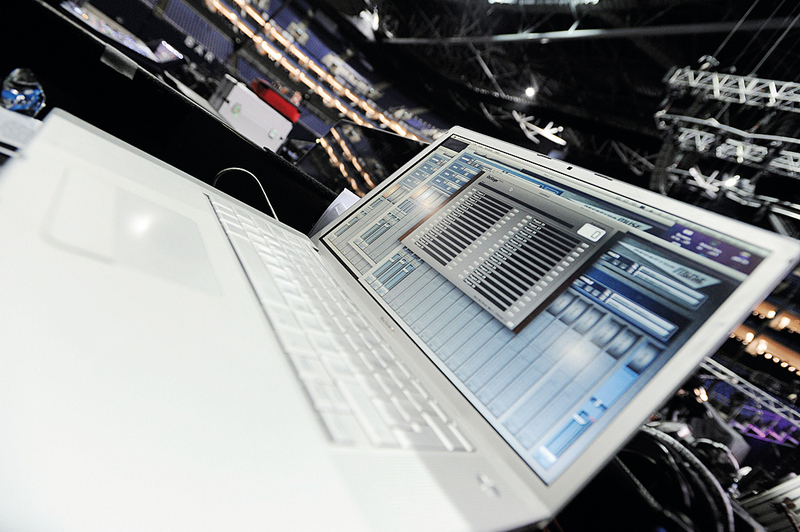 I used it on Snow Patrol and Verve too, with Logic, but it seems to work with Live too." Sorry, Pro Tools and Ableton Live? Live is doing live drum processing? PE: "Yes, it's quite complicated! But Kerry went down to Christian [Eigner, drummer]'s place in Austria and they ummed and ahhed about the best way to do it. And this is what they came up with. The band decided they wanted to use live drums, but they wanted them to sound like electronic drums, depending on the song, of course. "We decided not to use triggers so we're taking the live drum sounds into Live and processing them live. The drum sounds are going in via a MOTU 828 interface, processed in software then output via another 828. Live is so versatile - they tried it out and they love the sound. No latency, and we can get the electronic sounds we need whenever we need them." So there's plenty of playing, but how many tracks come off the Radar? PE: "18. Though it changes from track to track. The band tend to play all the lead sounds. All the big riffs that you'd recognise are all played, mainly using the Receptors. Meanwhile incidental stuff, percussion that Christian doesn't play, some of the strings that Peter [Gordino, additional keyboards] doesn't play come off the Radar. "They've got three keyboard players so they do play a lot but sometimes it has to go to the Radar." And are the lighting queues from the Radar? PE: "No they're from Graham, who's front of house! He's a great lighting director. There are starts for triggering the video but as for the performance, the flashes of light, that's all old school. During the gig he's dancing around, really getting into it." And once again, a backup Radar for your Radar? PE: "Yes, we have two Radars, an A and a B - one is ran simultaneously for backup, so it's just like the old days. You set one off and the other is set in chase. There's a tone on a spare track on each Radar and they feed into a Radial SW8 switch box. "If there's a green light there then it can hear the tone. If that stops it immediately switches to the output from the B machine." How quickly can it make the switch? PE: "You don't hear it. We've done A to B tests and the band didn't notice it. And it's happened live a few times. The daftest times was when we had these torches mounted here [Paul gestures towards a pair of mini gooseneck lights, now safely away] and they got knocked and fell perfectly and hit the stop button. We looked and went "It's on the B machine! Why's it on the B machine?" And then we realised what had happened." Can it flip back from B to A? PE: "Ah, it'd be out of time then. So you're stuck on B until the end of the song. But it's not like we have to make it to the end of the gig on our backup - with everyone staring at it…"
Is all the kit brand new for this tour? 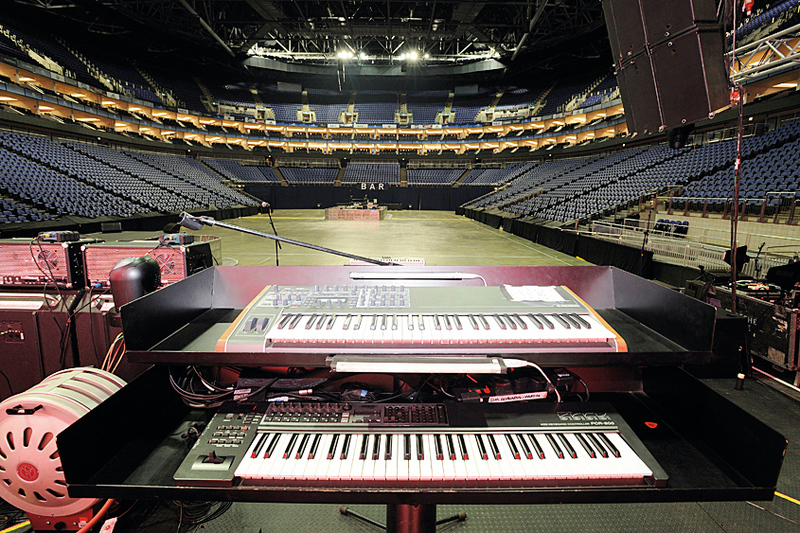 PE: "The Radars were on the last tour but the keyboards are all new. We had Viruses before but we've got the newer ones for this tour. The Receptors are all new too. And this is the first tour we've done with the L-Acoustics K1 rig, only because it's so new. "This package cost one million Euros and so far there are only ten of these in the world. We're only using the O2's house delay compensation speakers, the rest is all ours and we're very pleased with how the K1 sounds. Then there's two new Midas XL8s - one by the stage for monitor mixing and another for front of house. We're the first tour to use two XL8s." One of the team's two Midas XL8s. The entire rig seems incredibly well thought-out and compact. Does it pack up pretty small? PE: "It's incredibly compact. Unbelievable, in fact. U2 were following us around and they had a hundred trucks, but then that was the whole 'claw' set up. We're doing this in eight trucks and we can pack up the backline in half an hour." What has been the biggest gig of the tour? PE: "Milan was 73,000. The O2 is 17 or 18,000. That's big. But Milan was 73… It was unbelievable." PE: "This is Fletch's rig. He does a lot of the baselines off the Virus Polar here. And then there are two Edirol PCR-800 controllers, each of which triggers one the Receptors. There are two Receptors per player, and each is doing the same thing. They're pretty standard Edirol controllers but they're very good. He generally plays on this one and the other is the backup. If there are any problems he can just play the other one and the backup Receptor." PE: "This is Pete's rig. He gets the big, weighted piano keyboard, a Roland RD-700. With Pete only one Receptor is live and if that goes down I can switch to his B Receptor. And then he's got another Virus, he does a lot of stuff on that, It's a TI2. Wonderful machines." PE: "This is Martin's rig. He's not actually using this Virus. He's just using it as a controller. It was actually used in one of the songs on this tour, but we dropped that song from the set. "Again, two keyboards: the Virus TI2 and an Edirol PCR-800 controller. The top one is the main Receptor and the other is a backup Receptor." 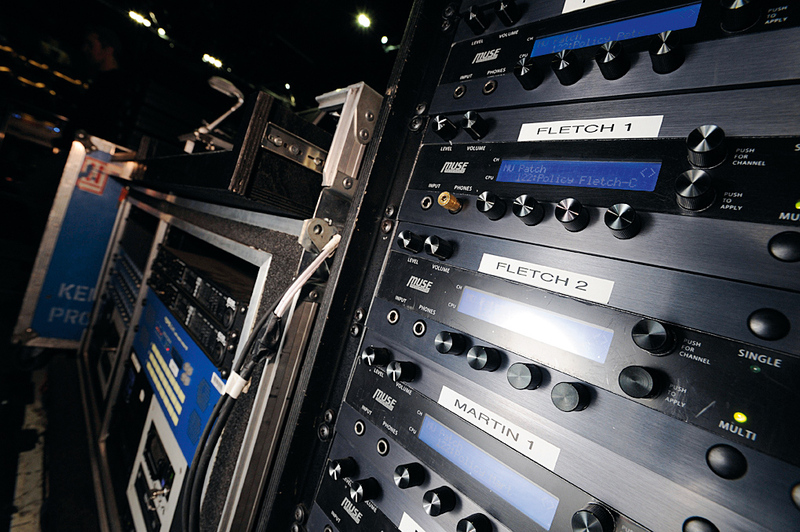 While the obvious star of the show is the hi-tech setup, Martin Gore's burgeoning guitar rig is a whole gig in itself, as guitar tech Jez Webb explains. Wow. There are a lot of guitars here. Jez Webb: "There are a lot for a synth band. A few more than I was expecting. I should have read the contract a bit closer…"
The keyboard kit, the Radars, everything seems very state of the art over there but here… amps… stomp boxes…it's a bit more rock 'n' roll. JW: "Well everything's off stage. This is the heart of it, the old TC Electronic G System which we used on the last tour as well and has worked well for us. Every song has its own patch, and some of them have three sounds in them. It gets a feed from Pro Tools and that switches the patches. "Before that I had to switch all the sounds, which is a bit of a pain if you're trying to tune the next guitar ready too! The output from the TC Electronic G-System goes into this switchable audio loop which is also switched by Pro Tools. The pedals here are always on, permanently kicking their output into the switcher and their output is switched in and out automatically when it's needed. The pedals are mainly distortions because the G doesn't do distortion. Then Martin's got a wah pedal and a fuzz pedal on stage too and that feeds into the loop here too. So hopefully I don't have to touch anything." TC Electronic's G System is the beating heart of Martin Gore's guitar setup. 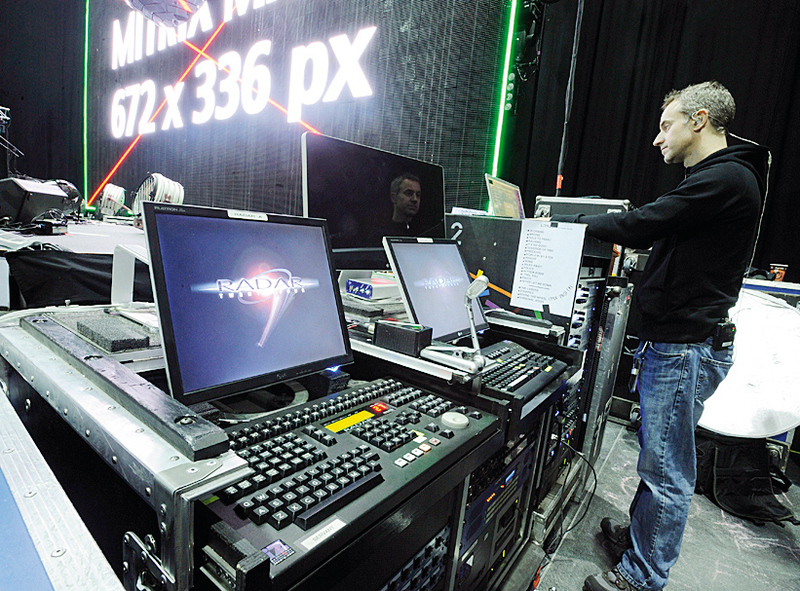 Seems that every hi-tech part of the tour is backup crazy, but not over here eh? JW: "Well I do have a bunch of spare pedals if one goes wrong. And there's a backup TC Electronic here. And a backup loop system here! But the worst thing that can happen is that one of sounds goes out without the required distortion effect on it until I can swap in another. The wiring at the back of the rack is pretty complicated but Whirlwind made a connector for me. I can leave everything in this rack connected and the output from the entire guitar system comes out on this patchbay here. And I put in a couple of auxiliary channels too and we're using those for the couple of pedals Martin has on stage." Where does the effected guitar go next? JW: 'I've got a stereo feed coming to two amp heads here, then onto the cabs, which are miked and which are all off stage. When I first started working on the tours - back in '93 for the Faith and Devotion tour - it went straight to the desk. 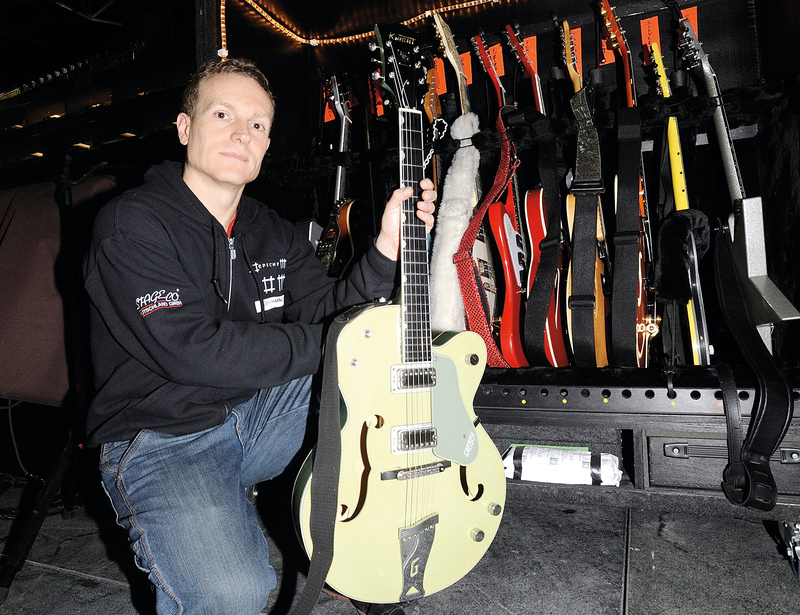 "There were no amps or anything, as that was the first time Martin had toured with guitars. I think he only played on three songs. But he's certainly come on from then! "Now we've got the two amps and two cabs here, covered up and miked with a Shure SM57 and a Shure KSM32. "He's got two 2-by-12 cabs with one of each mic on each cab. We need that for the sound. It would sound a bit ropey if we just went direct and they're a very rocky band at the moment." "I've had that 20 years! This is where I'm tuning: if he breaks a string, if something needs fixing. That said, very little goes wrong here. I think on this tour he's broken one string, and then he just carried on [laughs]. "And touch wood [touches workbench] we've had no disasters. So far!"